Liam O'Neill was born in Corca Dhuibhne, in West Kerry in 1954 and is among Ireland’s most celebrated contemporary artists. He paints using a palette knife to capture the iconic imagery of his own place - It’s wind beaten harbours, coastal fishermen, farmers and musicians are among his subject matter. Liam O’Neill enjoys painting the colour and movement of horse racing events and fairs. He also pays particular attention to portraiture; capturing the essence of literary figures such as James Joyce and Samuel Beckett. Almost sculpturally he carves their characteristic features and reveals the human and emotional essence behind what are well recognised public faces. O’Neill is interested in the nature of portraits and how a famous face can become broadly familiar and simultaneously depersonalized in the public eye. Through the process of looking and realizing these faces with paint, O’Neill reintroduces the humanity in these significant people. Liam O’Neill has gone back home to live in West Kerry again after thirty years in Dublin. When he paints scenes of Kerry his own relationship with the landscape appears time and time again. His direct connection with his home place provides him with endless reasoning to paint his surroundings. 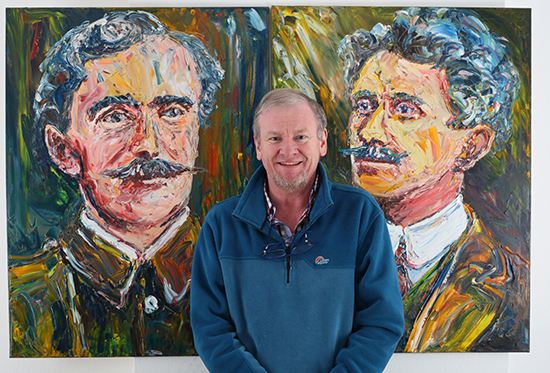 Liam O’Neill has exhibited widely over the past thirty years including Dingle, Dublin, London, Paris, New York and San Francisco. 2009 Portland Gallery London Summer Show.